The F8000 is Samsung’s flagship model with improvements on hardware and software design. Samsung has taken a knife to the outer edge again and engineered out most of the bezel. The death of the bezel leaves an impossibly thin frame. The F8000 is unmistakably all-screen and in my test model that’s the UE55F8000 is 55-inches worth of pure display. Sitting on an understated chrome boomerang stand, the display hangs in mid-air whilst its stand tries to disappear, leaving a floating display hanging in mid-air. Ports are a aplenty in the F8000 with four HDMI 1.4 spec (for 3D playback), three USB, Wi-Fi, LAN and VGA input. The USB connection can be used for consuming media from a USB drive or recording from the built-in tuner. Out of the box you get two controllers and a third one comes courtesy of your hands and the built-in camera. Similar to the Panasonic VIERA TX-L47WT65 I reviewed recently, the second remove features a touchpad and a microphone for voice navigation. 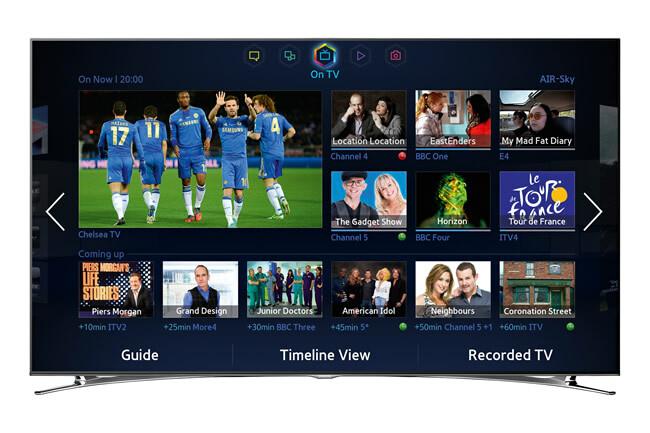 Samsung have re-designed the Smart TV interface, giving the F8000 a new intuitive menu system for navigation its features. I really like some of the new interface designs. Samsung have gone for five defined areas for showcasing different content from broadcast, on-demand and locally sourced media. Live preview videos, channel/programme images create a lively and dynamic home screen showcasing current, upcoming and recommended programming. The recommendation engine will analyse your frequently watched programmes and base its recommendations on past viewing habits. The Social screen taps into the usual array of online networks such as Facebook, Twitter, YouTube and Skype. Although a good idea in principal, I think Samsung could have better designed this screen to utilise social media content. The App screen lists all of your installed apps in an easy-to-use grid and makes adding new ones very easy. 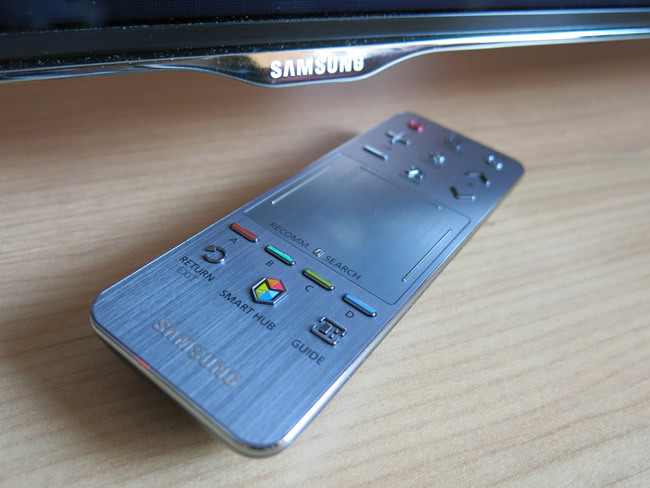 Samsung has the best range of Smart TV apps with the usual suspects which some of us have come to know and love such as BBC iPlayer, YouTube and Netflix. The F8000 features an all-new backlit screen which solves the past problems of uneven light quality. Samsung have made a step change in improving black levels and backlight for dark scenes. Colour reproduction is some of the best I’ve seen from an LED set. Bright and vivid or moody and cinematic options are available through the presets. 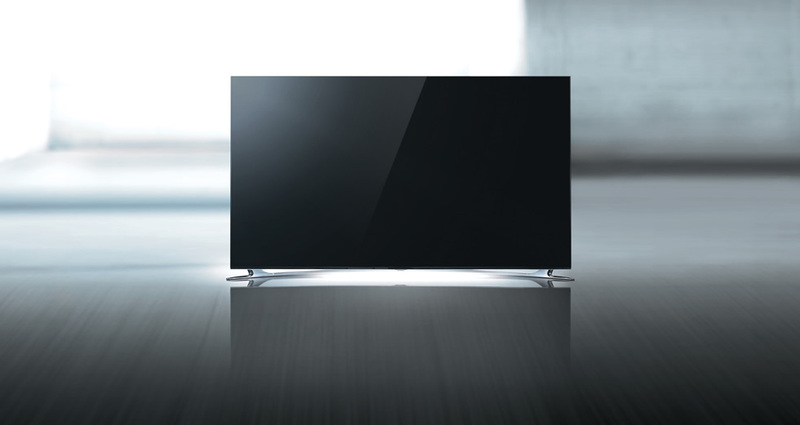 Thanks to its 200Hz panel, the F8000 handles fast moving images without juddering. TV’s of past have often left a slightly bitter taste when it came to sound reproduction, as though it was an afterthought. Although the F8000 is incredibly thin, sound quality hasn’t been compromised. A decent level of bass reproduction helps provide well-balanced sound. This makes it great for movies and general TV programmes. 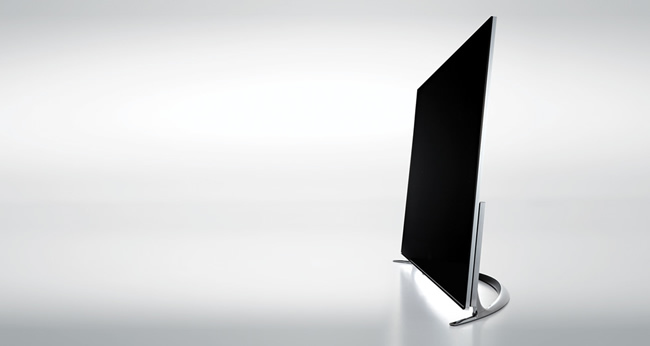 Samsung has worked incredibly hard to make the F8000 a fantastic TV and continues to invest in building not just a better looking TV, but a better working TV. The evolution of the user interface is what impresses me most and where I think all TV manufacturers should be focusing on in 2014. Picture and audio quality have made steady improvements but it’s at a stage where most will struggle to see the difference until 4K is available to the mainstream. Samsung have made some impressive improvements to the F8000 and I look forward to seeing what they come up with next.